Carol studied at Glasgow School of Art where she gained a First Class Honour’s Degree and was awarded the prestigious Newbery Medal. Her Post Graduate studies continued at the world famous and renowned Royal College of Art in London, where she graduated with a Master’s Degree. 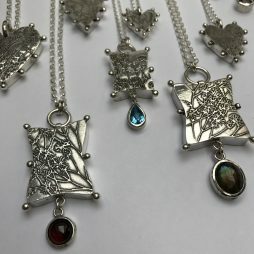 More recently Carol has attended North College in Glasgow and in 2012 won the Jewellery Fashion Craftex Award, with the Trades House of Glasgow and in 2013, the Silver Award for Design Fashion Jewellers with the Goldsmiths Craft and Design Council of London. 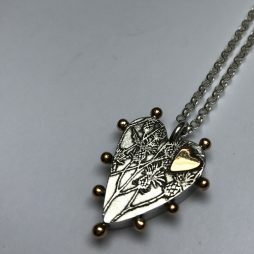 Carol A Docherty Jewellery, brings to you, a unique collection of bespoke jewellery, encompassing designs from the formal to the quirky, the rational to the bold and beautiful, all handmade and as individual as you. Her inspirations come from a variety of sources including rich floral patterns, body decoration, tribal motifs, love symbols and many others, which combine to ensure your chosen piece is unique, timeless and truly something you will enjoy wearing, whatever the occasion. The gorgeous gems, semi-precious stones and pearls are sourced from near and far and carefully selected by Carol to ensure your jewellery is not only unique, it also gives you the feeling that no one else is quite like you. All of her precious metals are supplied by reputable U.K. companies and are guaranteed for quality and authenticity.